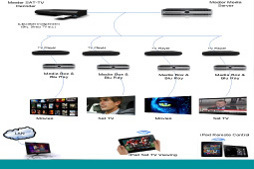 Stream based solutions allow the ability to watch content on your TV or listen to music from an internet enabled device. This allows these gadgets, like iPads to pull a stream from a server in the same way a pc in an office would be able to share a file on the network. Multiple devices can share the same stream server allowing for movies, music and TV to be shared within a household over your wifi or wired network. No matter whether you're looking to find a quick diversion during your coffee break, to catch up on a show you missed, or to sit down to the latest movie blockbuster, it's all available via a simple internet connection. With no requirement for a satellite dish you can have access to your channels in real time and directly to your TV. The system can be installed in under 2 minutes and provides immediate access to your favourite channels via a user friendly interface and simple to use remote. 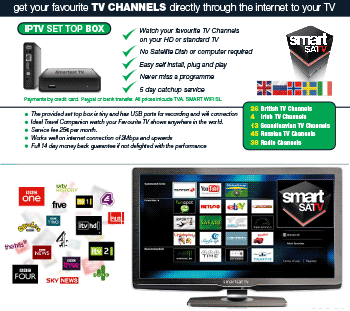 IPTV, or internet TV, is a service that enables you to quickly access a wealth of terrestrial, satellite, internet & video content which can be watched on your TV. NDS are specialists in stream based solutions and are delighted to have been selected as exclusive resellers of SmartSat TV within France. An integrated approach is of the utmost importance to us when designing a multi room media solution. At Net Dream Systems we take an open systems approach to design and product select with integration in mind. Playback of your music content is as simple as selecting what you would like to listen to, and where you want to listen to it. If you want to listen to the same music in different areas just select what you want to play and the rooms you want to play the music to, and the systems instantaneously does the rest. If you want to play different music in different areas the same rules apply. From the same interface that you access your music, you access your movies. In any room you want to watch a movie, either pop the disc into the Blu-ray/DVD drive or select a pre-stored movie from your iPad/ remote control TV display or web browser. Access and control your media via an array of interfaces, be it your TV display, remote control, iPad, iPod, web browser or touchpanel.